Home > Shop By Brand > BLACKFIRE Pro Detailers Choice Car Care Products > BLACKFIRE Carnauba Spray Wax 32 oz. WHIPLASH in a convenient spray! BLACKFIRE Carnauba Spray Wax gives your vehicle the rich, reflective shine of carnauba in a quick spray wax. There’s no easier way to give your vehicle a glossy coating of protection that creates WHIPLASH! BLACKFIRE Carnauba Spray Wax can be sprayed on and buffed off in minutes and the finish lasts up to twelve weeks! Hand waxing is well worth the time, if you have the time. If you don’t, use BLACKFIRE Carnauba Spray Wax. Genuine carnauba wax has been synthesized with proprietary polymers into a streak-free spray. The slick finish dries perfectly clear and creates a depth of color normally reserved for a paste wax. 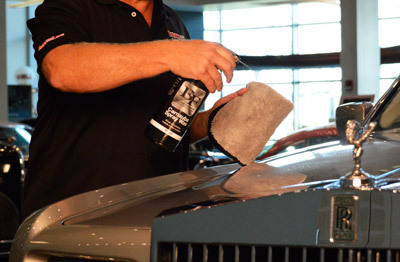 BLACKFIRE Carnauba Spray Wax offers anti-static paint protection to keep your vehicle cleaner between details. Dirt and water slide off the paint in most cases. You will notice fewer water spots and less dirt accumulation. When you do wash your vehicle, it’s nearly effortless because dirt and debris cannot get a firm hold on the slippery wax coating. BLACKFIRE Carnauba Spray Wax delivers beautiful results on all types of paint. It is an excellent product to maintain daily drivers. When you want a carnauba wax shine in less time, there’s no substitute for BLACKFIRE Carnauba Spray Wax. Spray BLACKFIRE Spray Carnauba Wax onto a section of paint. Wipe off wax with a clean, soft microfiber towel. Use a second clean, soft microfiber towel to buff the finish to a high gloss. I have been using this product for about one year and have very satisfied. I use a buffing machine after using the product for a even better shine. Always quick shipping from Autogeek. I really like this spray wax. I have been detailing my car for decades. I go back to the "Blue Coral" paste wax days when you labored half the day because it was difficult to buff it off Later I discovered liquid carnauba wax which gave a deep long lasting shine. Blackfire Carnauba spray wax is very easy to apply and buff off .I can literally do my Mercedes 300 in 35-40 minutes and it buffs up to a rich shine, I can use this product frequently and even "spot wax" (do just one area ) sometimes when time is limited. I do like the results but I remain skeptical about the durability of a spray on wax as opposed to paste wax. Only time will tell but as of now (having used product two weeks) I like the results. ProsQuick and easy to use. Time saver. ConsJury is out on durability and whether it will last as long as a paste catnauba wax.